If you’re getting cabin fever this winter, we’ve got the cure: let us take you on the Harpers Ferry Road Wineries & Brewery Passport Tour now through the end of March! Visit the five partner wineries and a brewery to enjoy award-winning wines and brews, as well as be eligible for a chance to win prizes and special discounts on bottle and growler purchases. 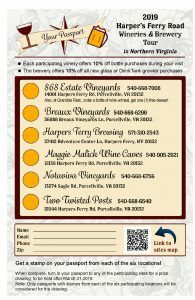 Let us take you on your Harpers Ferry Road Wineries & Brewery Passport Tour so you can enjoy your day worry-free! As part of our partnership, we are offering a 10% discount on sedans, SUVs, and Van Terras for your tour through March 31, 2019. Please provide the promo code 19PASSPORT10 to receive your discount!